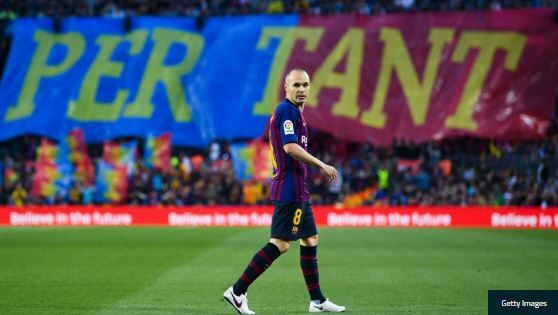 Andres Iniesta appears to have confirmed he will be joining Vissel Kobe by announcing he is en route to Japan. The Barcelona icon revealed at the end of last month he would be leaving Camp Nou after 16 seasons at the club, during which he won nine La Liga titles and the Champions League four times. After reports of a switch to Chongqing Lifan were denied by the Chinese Super League side, Kobe emerged as the surprise frontrunners for Iniesta’s signature. And on Wednesday the Spain midfielder posted a photo of himself on board an aircraft with Japanese billionaire Hiroshi Mikitani, the owner of the J-League club. “Heading to my new home, with my friend,” Iniesta wrote, mentioning Mikitani in his tweet. Mikitani is the chief executive of Rakuten, the electronics company that is the shirt sponsor of Barca.